For months, the question on everyone’s lips has been, When will ‘Sisters For Sale’ be released? Last week I announced the details of our premiere, which will be held on 29th November at the Human Rights Film Festival in Naples, Italy. Several team members and supporters from across Italy and Europe are planning to attend, which is great. Now the question everyone is asking me is if I’ll be there. Many have simply assumed I will be. Of course I’d love to be there for the world premiere of the film I’ve spent 5.5 years of my life working on – not to mention the fact that Italy is one of my favourite countries on Earth, and I know some amazing people in Naples I haven’t seen for many years. But the answer is no – I won’t be there. It’s not a question of money. For me, it’s primarily an environmental question. I’ve been very fortunate in having spent over 11 years abroad, living and travelling around 65+ countries of the world. In all that time and travelling, you’d be amazed how little I’ve flown. The vast majority of my travels have been made overland – by public transport, shared vehicle, or touring bicycle. I’ve travelled overland from Morocco to Moscow, Lofoten to Cappadocia, Lombok to Ladakh, Anchorage to La Paz. As AirAsia loves to tell us, now everyone can fly – but should we? Alongside eating animals and having children, it’s one of the biggest impacts we as individuals can make on our planet. I have flown, and will fly again – but it’s not something I do lightly. For me, a film premiere doesn’t justify a return trip around the globe. I realise that’s not a popular attitude – and I think that’s part of the reason our planet is such a mess. A flight is not simply a flight. It’s an expression of values which becomes part of a broader culture. Some will say that the actions of individuals can’t or won’t make a difference. 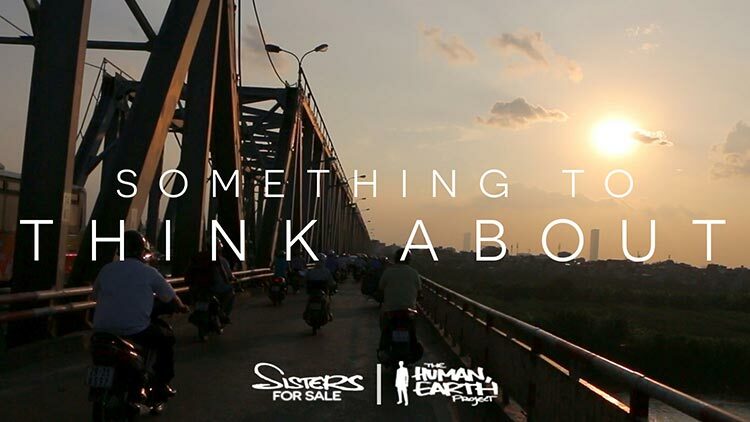 ‘Sisters For Sale’, ‘The Human, Earth Project’, and my entire life stand in direct opposition to that idea. After all, what else is a culture made of? PS. As I was finishing this message I received the details of our Australian premiere, will take place in January. This one is much closer to home, and I do intend to be there – details soon!